+ Added video of the red-carpet event ( the Girls appear at 3:06). + Added red carpet close-up shots of the 9 ladies. + Added post-award backstage interview with the Girls. History was made today at the 26th Golden Disk Awards held at the Kyocera Dome in Osaka, Japan, when the 9 ladies of SNSD won the Digital Daesang award, making them the only K-Pop girl group to win a Daesang award 3 times in a row. The 26th Golden Disk Awards was held over 2 days in Osaka, Japan this time around. For the 1st day, SM labelmates, Super Junior swept away the competition by winning 4 major awards (the MSN Japan Award, Popularity Award, Bonsang Award and the highest honour, the Daesang Award for physical album sales). On the 2nd day of this prestigious event, at approximately 8.40 p.m. (Japan time), the 9 ladies of Girls’ Generation were called onstage to receive the 1st of the 2 awards that they were to win this night, the Digital Bonsang Award for their 2011 Korean single, “The Boys”. As always, the 9 ladies were quick to thank their fans (SONEs) for this prestigious win. On a personal note, Taeyeon was quoted as saying: “SONEs gave us so much love and support. When it gets tough and tiring, we thank you for your unconditional love ”. Next, as a group, the ladies all quipped: “Thank you to the fans who love not only one track ‘The Boys’, but the 3rd album as a whole. In the future, we will be a more hardworking Girls’ Generation”. However, that was not the end of the good news for our favourite 9 ladies. Approximately 90 minutes later, a 2nd call was made for the beautiful and talented ladies of SNSD to appear onstage again, this time around to receive the Digital Daesang Award, making them the 1st girl group to win 3 Daesang awards in a row 😀 ! The Girls won their first Digital Daesang award in 2009. This was followed by them winning the Disk Daesang award the next year (2010). Now, with the ladies winning the 2011 Digital Daesang award, the Girls have established a record of sorts by being the only girl group thus far to win this number of Daesang awards in a row :lol:. Remembering that Tiffany missed out on the previous (2010) year’s award ceremony, due to her knee injury sustained during the “Hoot” promotions, this year’s win is extra sweet because now all 9 members can truly partake of the joy of winning this Daesang award together. All I can honestly say is that full congratulations to the 9 angelic ladies are in order for this epic win :). May the coming year (2012) bring more success to the extremely hardworking and multi-talented ladies of “Girls’ Generation”. SNSD Daebak ! SNSD Jjang ! –What were your thoughts when you were called for the daesang? -Did you predict your win? -Is there anyone you’re thinking of right now? 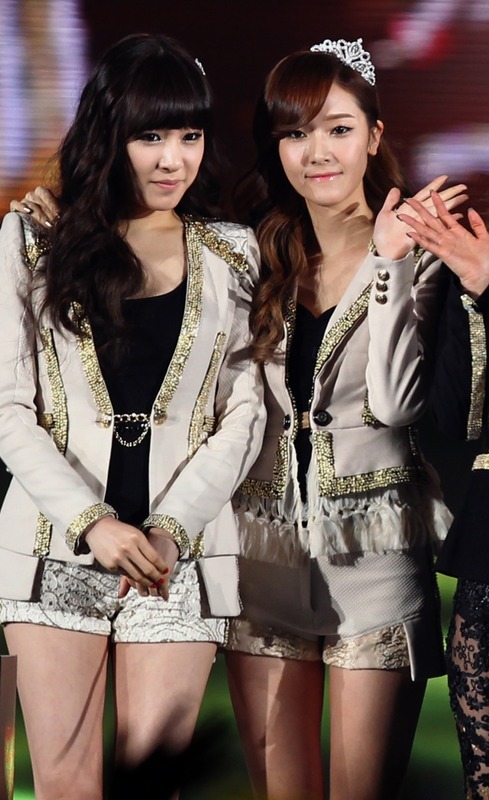 -The members were all sad when receiving the daesang last year because Tiffany wasn’t present due to an injured leg. This year must have been more special because you received it all together. -What kind of year was 2011 like for Girls’ Generation? -You received the rookie award in 2007, digital daesang in 2009, and Golden Disk daesang in 2010. You recieved the daesang again this year, as well as a bonsang. You have a deep connection with Golden. -During the past 3 years, you didn’t miss a single daesang, getting the digital daesang one year, the Golden Disk daesang the next, and the digital daesang again this year. Girls’ Generation is the second singer to receive the daesang for three consecutive years following Kim Gunmo. -You’ve been continuing to rise after your debut. But I think there would have been times where you were tired as an individual. When was that? -A word to fans all over the world. sources: Sports Daily, spiceshoe@soshified.com, MoonSoshi9@soshified.com, NeonCyro@soshified.com, letaengbutt@soshified.com, Sakura29@soshified.com, xinmsn, ch0sshi@soshified.com, MoonSoshi9@soshified.com, SankeiUp@youtube.com, all other posted images credited as tagged. Go SNSD, you guys are the best!! !I am so happy for them right now. Looking spectacular as always, our Fab 9 do it again! they look gorgeous in black especially Taeyeon! ^^ and Congratulations to the girls! Of course, SNSD looking so fab as always! These girls are really Goddess like! I swear! OHHH YES!! congrats SNSD ❤ hwaiting!! I said: “no matter how difficult it gets, there will always be millions of SONEs the world over who love and support you”. I love SNSD. For being who they are. For not changing even a bit after years and years of successful career. There’s no way I could be happier right now. Ooh, thank you Kenneth.. This post made my day. Awkward Maknae feels uncomfortable in her dress? obbareul silmanghaji maseyo !!? alasseoyo ??? WOOHOO!!! All Nine Angels are Winning, winning, winnning!! !